On 12/25(Fri.), we will have a Christmas Meeting! What's more, we are going to exchange gifts on this special day. Get ourselves ready and offer a 200 dollar gift! 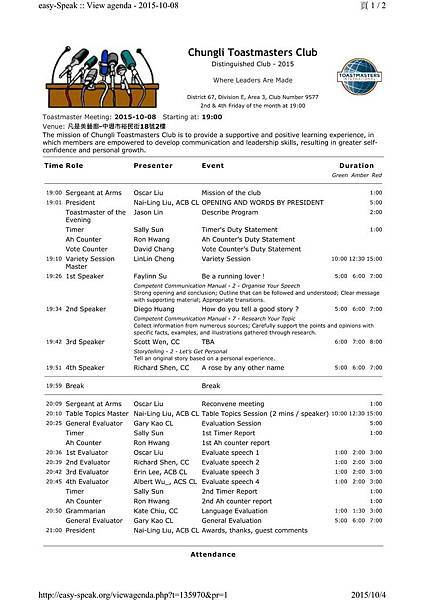 The other good news is that Louis Fu, an excellent and experienced toastmasters, will deliver a great speech. The speech title is "The other side of France and the Frenchmen that you don’t know." You are invited to join the meeting of toastmaster on 2015/12/11. The theme of 12/11 is "Christmas gift " . You can share to us "What is the greatest Christmas gift have you ever received ? " We will also have a new member induction ceremony to welcome our new friends, Jerry and Amy. You are invited to join the meeting on 2015-11-27! You are invited to join the meeting of Chungli Toastmasters Club on 2015-11-27. Enclosed please find the agenda. You are invited to join the toastmaster meeting on 2015/11/13 (this Friday). Come and join us! 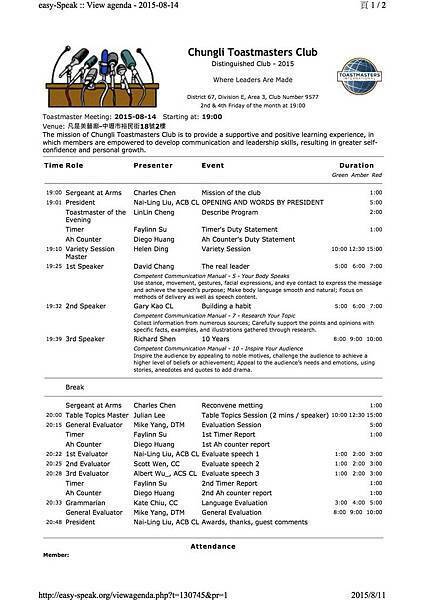 You are invited to join the meeting of Chungli Toastmasters Club on 2015-10-23. Enclosed please find the agenda. Meeting Minute - 2015/10/08 - Regular Meeting! It was a successful TM meeting full of surprise and learning. The meeting was started from the first surprise-“temporary meeting room in 3F” because the original meeting room was occupied on Thu. However, it’s an impressive experience for all of members to join the meeting in new places, we will never forget it. You are invited to join the meeting of toastmaster on 2015/10/8. Thursday. 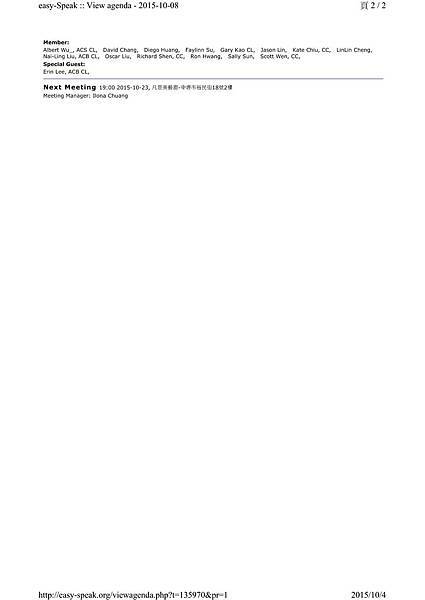 The agenda is attached in this mail. laughter and surprise. It is great to enjoy his speech. 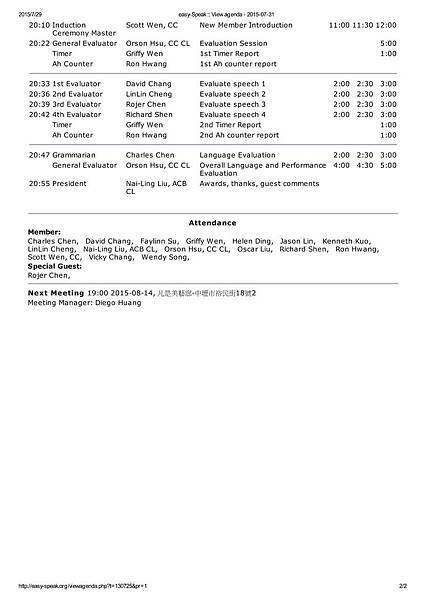 The another speaker , Richard will on behalf Chungli to join Div. let’s have fun at 凡是美藝廊-中壢市裕民街18號2F at 7:00pm on 10/8(Thursday). Welcome to join the most important event in our club. Meeting Minute - 2015/08/28 - Regular Meeting! You are invited to join the toastmaster meeting on 2015/9/11 (this Friday). The agenda is attached in this mail. The meeting theme of this week is The power of words. Join us on 2015/8/28 regular meeting! 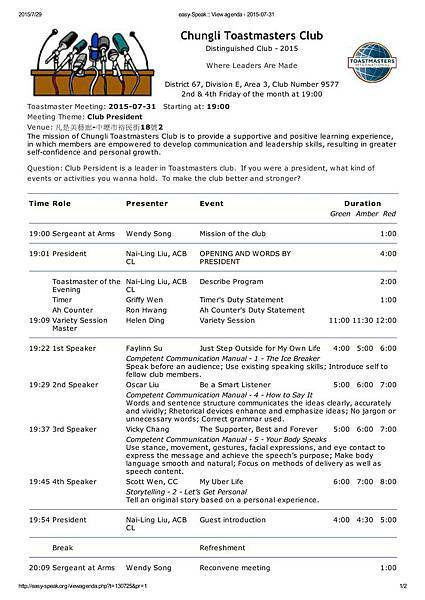 You are invited to join the meeting of Chungli Toastmasters Club on 2015-08-28. Enclosed please find the agenda. This week we will have a special guest coming all the way from Hsinchu, Andrew Chen, he is going to conduct a workshop “Talk to Anyone in Any Topic!” We all had this kind of awkward experiences. Such as: You are too shy to talk to someone you like. Or you were late, but accidentally bumped into your boss in the elevator. Or had problem with talking to a stranger who sit next to you in the wedding ceremony of your high-school classmate. Or you needed a “warm-up” chatting with an important client before starting the meeting. Meeting Minute - 2015/08/14 - Regular Meeting! Join us on 2015/8/14 regular meeting! You are invited to join the meeting of toastmaster on 2015/8/14. 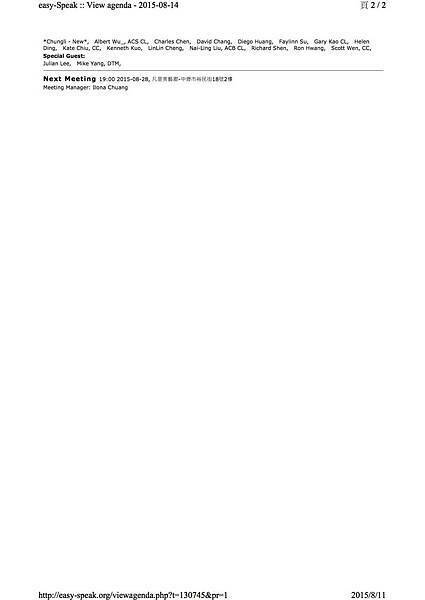 The agenda is attached below. This week, our senior member Gary Kao is going to deliver his speech, “Building a habit”. Have you heard Gary 's speech ? I believe many people haven't . I can't wait to hear his speech. The another energetic speaker , Richard Shen will reach a milestone. He just have joined our club for a year and will deliver his C10 speech “Tell Yourself a Good Story.”. Wow , It is fantastic. Let's witness this important moment together. The General Evaluator is Mike Yang. It is our honor to invite former District Governor . Mike is an excellent speaker. Come and hear his outstanding oral expression. We are pleased to welcome you to enjoy the speeches. Come relax and let’s have fun at 凡是美藝廊-中壢市裕民街18號2F at 7:00pm on 8/14(Friday).